Shelves are a great place to display seasonal decorations! Whether you go all out or just add a few touches, these ideas are sure to inspire you. In my book, plaid is one of THE most fun patterns to decorate with! I love using it for every season, but especially when I’m decorating for fall and Christmas. 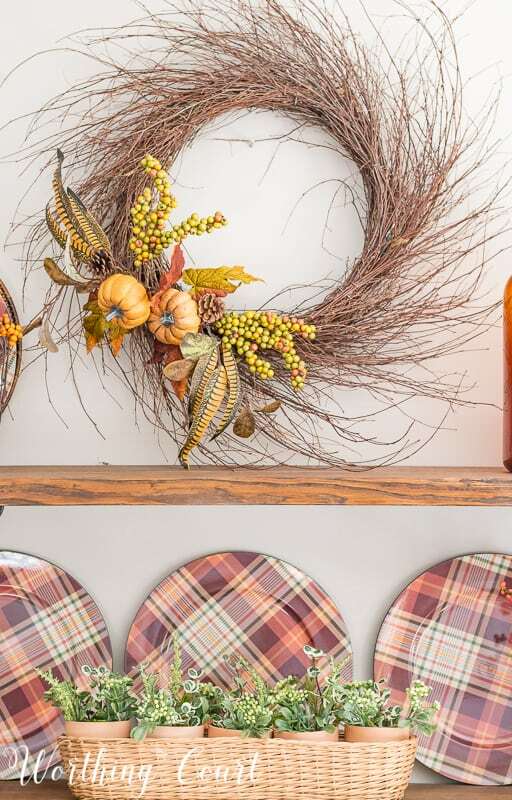 I found these plaid plate chargers a couple of years ago and I’ve been trying to figure out a way to use them in my fall decor in more prominent way than a tablescape. You may already know that I always include some sort of seasonal plates whenever I decorate the open shelves in my breakfast room, so it hit me – why not use these chargers in the same way? Bingo – they worked perfectly and now this shelf display is my most favorite one that I’ve put together for fall yet! The chargers have a tiny bit of green in them, so I added just a couple of touches of green to the shelves too. The mini boxwood wreath lives on the lampshade year round, but I also added a dark green plate in front of the charger in the wire basket on the top shelf and I also added a few terra cotta pots in a basket with sprigs of faux greenery. If you have a sharp eye, you just might recognize that basket from the chest at the top of the stairs in my foyer. The fall colors in the plaid on the chargers are a bit muted, so brighter pops of orange from plates, faux bittersweet berries and pumpkins really pull the color out and bring them to life! Sadly, these chargers are no longer available, but I found some awesome fall plaid plates that you can purchase HERE (affiliate link, see my full disclosure HERE). 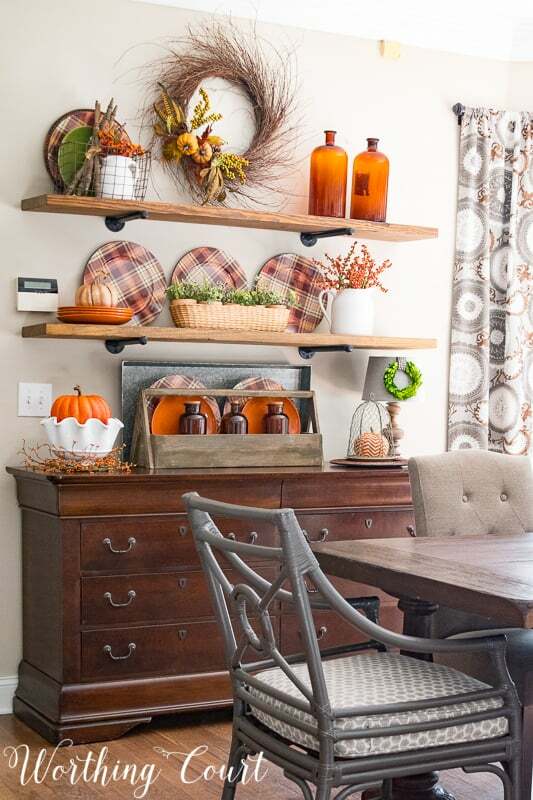 I used a plaid fabric covered pumpkin in the centerpiece on my table in this room and even though the plaids don’t exactly match, I think they tie together very nicely. Click right HERE to take a closer look at the centerpiece. Some of you will be glad and some of you will be sad, but it was time that my pig head, Mr. Herbert was put to bed for a while. I, for one, was sad to see him go, but it was time for a change. A grapevine wreath with a couple of faux floral bushes tucked into the branches is a nice change, I think. Mr. Herbert had lived there for a long time, through all of the seasons, so it will be fun coming up with something different to use in his place. Because of the large opening between my family room and kitchen/breakfast area, these shelves are one of the very first things that you see when you enter my home from the foyer and into the family room. So, it’s important to me that whatever I do on these shelves ties in with what’s in the family room too! 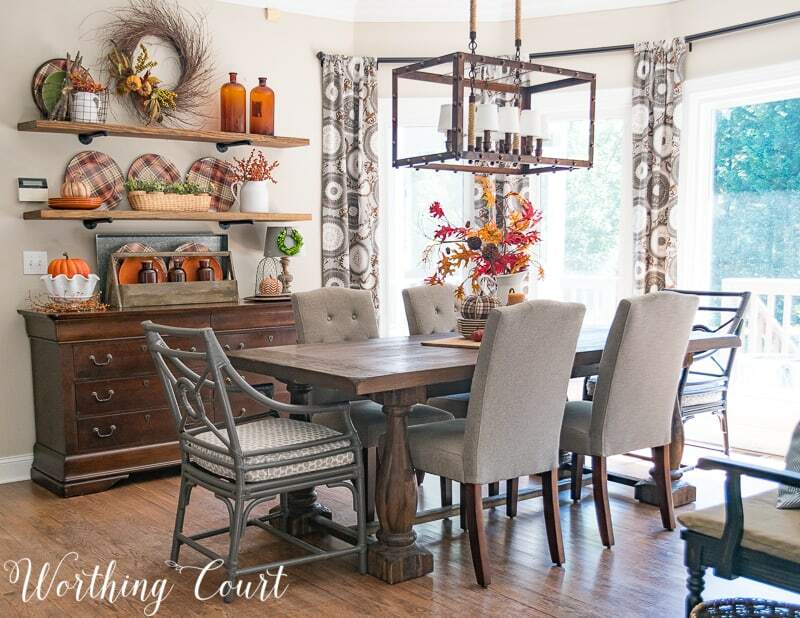 Be sure to come back on Thursday, when I’ll share my fall family room so that you can see how both spaces tie together! I love the plaid chargers, they just seem to bring the arrangement to life. Beautiful! Definitely miss the pig! He was a favorite…I even bought one after seeing yours! The plaid chargers look great on your shelves!!! Love it! I love the open shelves and your plaid chargers. Fall is one my favorite times to decorate. I love the open shelves and all of the decorating possibilities they give you! – all year long! They look great … I do miss the pig, though! Looks great! I like how the chargers pick up the color in the curtains. The plaid is great but I miss the pig head. I’ve been crushing on it every since I saw yours. I too miss the pig! I had to order one after I read where you got yours. I’m still waiting for delivery. The plaid is very warm and welcoming! The shelves are lovely and you do a great job decorating them. Hi Suzy, Seems like I’m in the minority, but I’m glad to see Mr. Herbert go. 🙂 I love your breakfast room! The plaid chargers, simple but beautiful wreath and cool brown bottles, etc. are just lovely. I’ll look forward to seeing your family room. LOVE how you used the plaid chargers. What made it pop for me was using the pumpkin/orange colored dinner plates at the bottom. Perfection. Oh, poor Herbert! He’s actually probably relieved, though, to get a break! A good long nap and he’ll be ready to serve again! 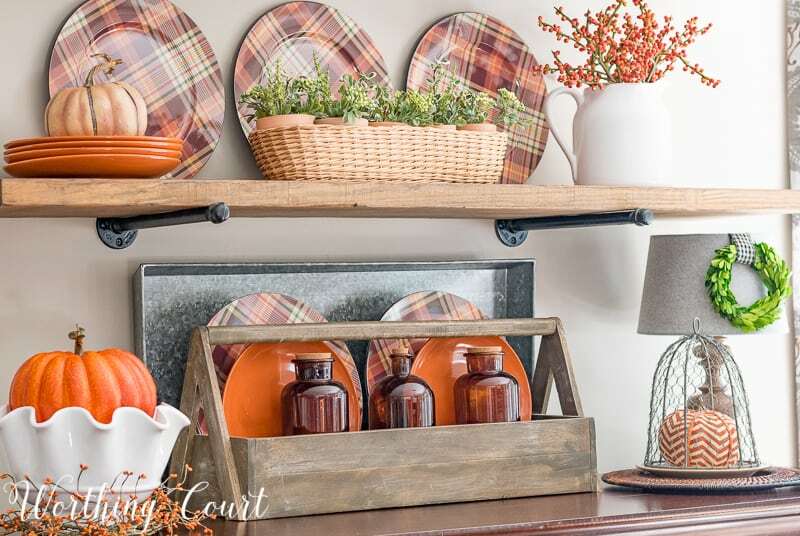 Your fall display is very nice and the plaid plates add a novel touch. I like the pitchers of faux bittersweet, especially. So pretty , especially with the plaid chargers. Autumn is my favorite season and you’ve given me a few great ideas. Thanks! Super inspiring, I so hope to get my decor out today. Yoursis so classy and clean…nice to look at! I love the wreath. To me a little plaid is enough. The lovely sweep of natural items on the nice twiggy wreath breaks up the regular round shapes of the charges just beautifully. Thank you for sharing! Perfect!! Love everything. Happy Monday and thanks for sharing. When I opened your posting the first thing I noticed was Mr Herbert was gone……he will be missed. 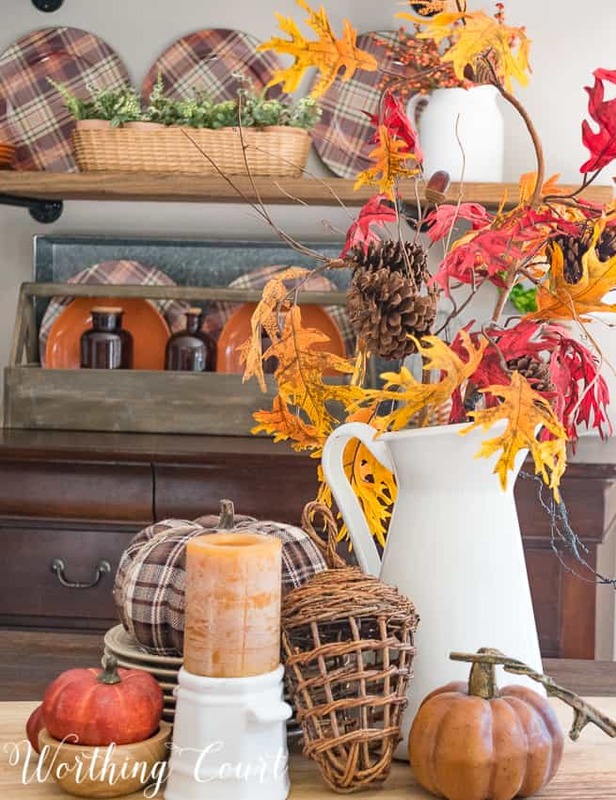 Love your plaid theme, very Fall looking indeed. Your shelves look lovely. I totally see why you are so pleased with them! Great look! Didn’t get enough of your dining tablescape though. Maybe another time? Looks great! I miss the pig tho…..always loved him! 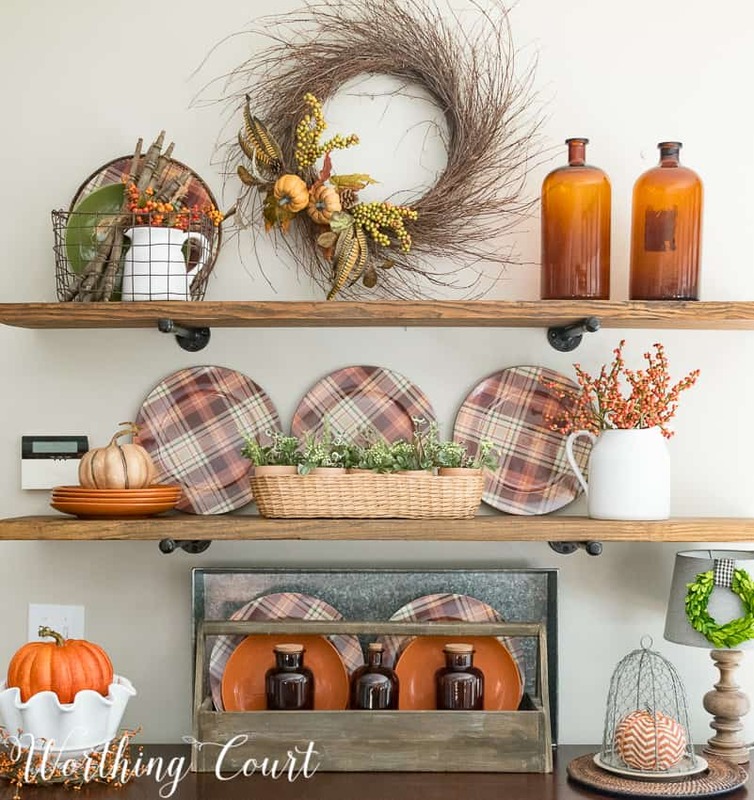 Love the plaid in your fall decorating! I like the wreath you hung in place of Mr. Herbert. It looks lovely – except for removing Mr. Herbert! I love plaid and am always looking for ways to add it to my decorating. The plaid touches are so pretty. Very classy! While I love the plaid plates, one of the things that caught my eye was the brown bottles! They r4eally bring out the brown in the plates. Love that! Those shelves are lovely! If plaid doesn’t say Fall, I don’t know what does! I have two plaid throws, very different, though, and I cannot wait to put them out every Fall. Everything looks very warm and cozy! The plaid plates and cool wreath are the stars here!! Like it all! Everything seems to fit just right somehow! I love the plaid chargers and the traditional fall colors you’ve used! I think that it’s not fall without a little orange! Am a push over for plaid for the holidays but have never seen Autumn colored plaid. Just love them. Suzy, I just love all of your ideas! 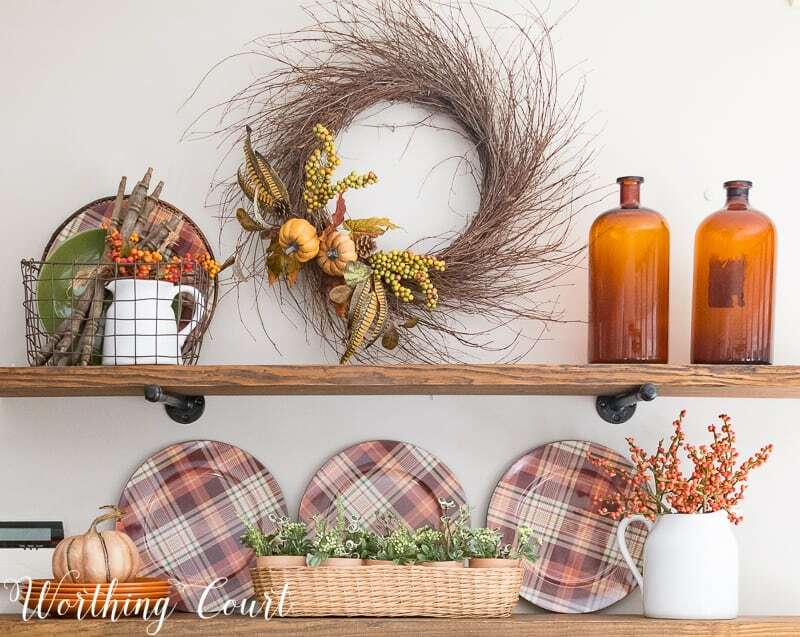 Your shelves turned out beautifully–so much so that you inspired me to get going on Fall decorating, though it has been quite HOT in So. California. I know you said that the Fall orange plaid chargers are out of stock, but could you tell me who made them please? Do they show any information on the back of the chargers? I bought some of the Pier 1 plates, but they do not have any chargers. I already have too many Fall plates, so I was hoping to find the chargers with the all over pattern like yours to complement my existing plates. I particularly love the plaid on yours! Thank you so much, and Happy Fall and have a Blessed Thanksgiving! Love the plaid chargers, wish they were still available! Like the new look with the fine, twiggy wreath. Where did you gt it? I love the “wispy” look. Loved your pig also, bur sometimes things have to change . My new home is almost completed and I have been rethinking some of the wall arrangements that I have used over particular pieces of furniture (for some time) in my old house, what I display in my hutch, living room bookshelves and on the mantle. My new home is totally white (except the bathroom) and the floors are wide grey/brown planks so it is a clean slate. Your changing shelf displays are an inspiration to me to make some changes in what I display and do some rotating of accessories . Your home is lovely and so livable and I really enjoy your blog sharing all the great things you have done with it, Keep up the great work! Hi Jill. The wispy wreath came from Hobby Lobby. I just stuck a couple of picks into it for fall. 😀 Have fun in your new home! You inspire us to find our heaven on earth in our homes every season. Thank you! I LOVE the new Fall shelves! But I must say, I miss the pig! Having it gone is good for a Change, but don’t leave it out forever! Plaid is my absolute favorite so I adore your plates and plaid pumpkin. I am new reader. I LOVE your blog and these shelves are amazing. The chargers look awesome! Love the plaid plates that are displayed! And the bottles are cool! Like the arrangement of color that takes your eye over the whole space! Can’t get enough of those plaid plates! Beautiful fall arrangement! I made these shelves for my diningroom. I LOVE how they “finished” the look I was trying to achieve. Thanks for the inspiration! Fall is my favorite season. I think the checkered chargers are so cute and unique. I love looking at the seasonal arrangements on these shelves.